I derive my style and theme from the epics and the work from past masters of the art, like Banayya Garudadri. Minimal lines that are precise can speak volumes about the complexity of the higher power. Just as the village Surpur has been renamed Shorapur Town, I see my traditional line painting being replaced by modern style. This is my tribute to the dying art form. For me, line art represents energy, and I am keen on shifting away from divine paintings to concentrate on the natural world around me. Krishnaprakash Vasant Martand was born in Gulbarga, Karnataka. 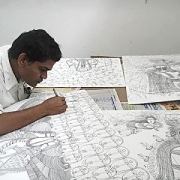 As one of the 12 artists across India, chosen to attend a program at NIV Art Centre, New Delhi, he had the opportunity to be mentored under Anoop Kamath. Martand specializes in ink and paper and line art that mainly focuses on heavily ornamented gods and goddesses from Indian mythology. Using Sakura, Pigma, Micron pen on Canson paper, he makes use of clean lines and whimsical reimagining of characters that are usually monochromatic, intricate and calligraphic in their treatment. The Surpur miniature paintings greatly influence Martand, who counts K.S. Nagure an artist from his hometown, an inspiration. His works feature in NIV Art Centre, New Delhi, Moksh Art Gallery, Mumbai, Hasta Gallery-Bangalore, and Studio Palazzo, Chennai.